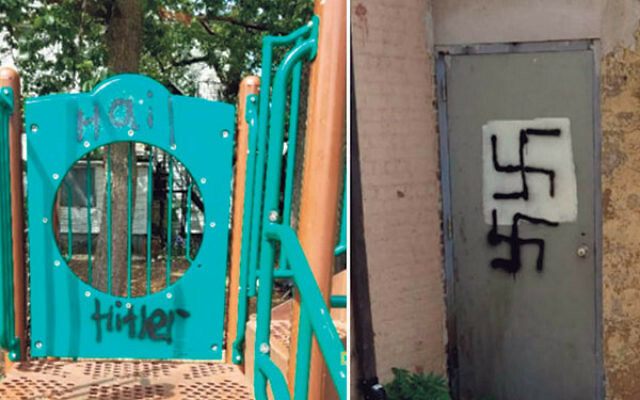 Swastikas and the words “Hail Hitler” were spray-painted in the playground at Yeshiva Ketana in Lakewood. 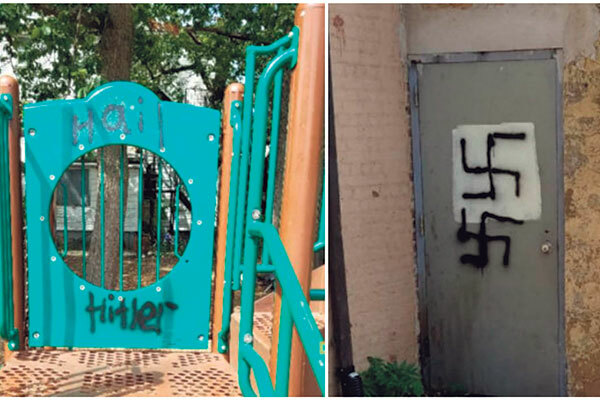 The first occurred in the Orthodox community in Lakewood on Aug. 25, when spray-painted swastikas and the words “Hail Hitler” were discovered on playground equipment at Yeshiva Ketana. Four days later, swastikas were found spray-painted on benches and playground equipment at Echo Lake Park in Howell Township. Cohen praised the quick response of both the Lakewood and Howell police departments, but did not want to speculate on whether the two incidents were connected. “Our hope is that there will be a complete investigation and that the departments will share information and coordinate with the prosecutor’s office and the bias crimes unit to determine if there was a connection,” he said. Citing the 2015 incident of a firecracker thrown at the wall of a synagogue in Passaic, Cohen said the perpetrator was apprehended after a member of the community contacted law enforcement with information on the suspect. He said he hopes residents of Lakewood and Howell will do the same. Cohen noted that the ADL’s annual audit of anti-Semitic incidents, released on June 22, showed a total of 137 occurrences across New Jersey in 2015, a 28 percent increase from the 107 incidents reported in 2014.